Photo of the restored Veterans Room by James Ewing. 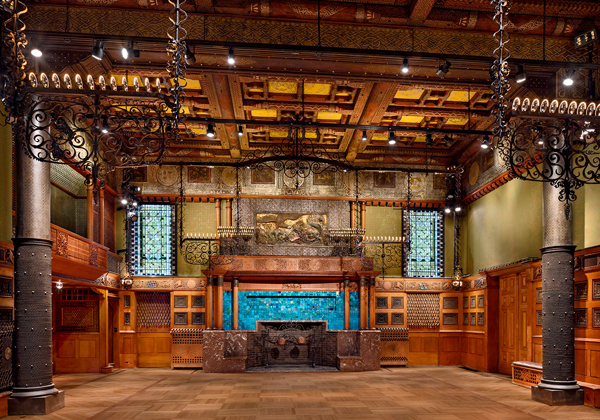 The Veterans Room at the Park Avenue Armory — completed in 1881 by the then-brand-new dream team of Louis Comfort Tiffany, Stanford White, Candace Wheeler and Samuel Colman — may be as close as any room in New York City comes to such beyond-words fantasia. Depending on which inch you’re looking at, it’s Islamic, Chinese, Greek, Celtic, Egyptian, Persian or an indefinable mélange of them all, on which no expense was spared. It’s never been a secret (the year it opened, this newspaper declared it “undoubtedly the most magnificent apartment of the kind in this country”), but for decades its glories have been concealed beneath bad repairs, inadequate lighting, brown paint and a patina of Gilded Age cigar smoke. On Monday it reopens to the public in all its historical swagger after more than a year of work, at a cost of more than $8 million, by the Swiss architecture firm Herzog & de Meuron, which is overseeing the restoration of the armory, built as a bejeweled boys’ club by New York State’s Seventh Regiment of the National Guard, the blue-blooded militia that was the first to respond to Lincoln’s call for troops in 1861. Since 2009, the armory, a once-crumbling landmark, has transformed itself into one of the world’s most sought-after venues for performance, music and supersized art projects. And in a sense, the Veterans Room, of all the Armory’s opulent reception rooms (three others have been restored so far), has the deepest spiritual kinship with a work of contemporary art, the feel of an installation by a young collective whose members were reacting to one another and making it all up as they went along. “I think of it as a preserved experiment,” said Jason Moran, the pianist and composer, who will be the first artist to use the refurbished room, for a series of performances he will organize through the year. White was only 27 when he began working on the room and had just recently joined the firm that became McKim, Mead & White, which would go on to design Pennsylvania Station. Louis Comfort Tiffany, 31, had only recently switched from painting to glass making. Candace Wheeler, one of America’s first female interior designers, was approaching the heights of her powers with textiles and wallpaper. Click here to continue reading about the Veterans Room restoration in The New York Times. Interested in taking a tour of the Armory? Click here for more information.